In many cases, it might seem like a groom doesn’t really need to take care of his looks that much during a wedding. After all, all the eyes will be on the beautiful blushing bride, so why a groom should bother dressing up a little bit more creative? Well, that is as ancient as pyramids of Giza! Right now grooms have to be equally dressed up and original as brides, and one of the best ways to express that are bow ties! These little accessories can speak more than anything during the big day, and thus, it is so important to choose it right. How? Bellow you will find out. What color of a bow tie to pick? It is easy. Either the black one or the color selected by the bride. In fact, the black bow tie is a time-tested classic that will look solemn and elegant, especially if you also wear a black and classic tuxedo. However, more and more future newlyweds start to choose not black, but the dark blue bow tie, which creates a more relaxed vibe. Both monochrome and subtly colorful bow ties look dressy, but not too serious, but also not too playful. 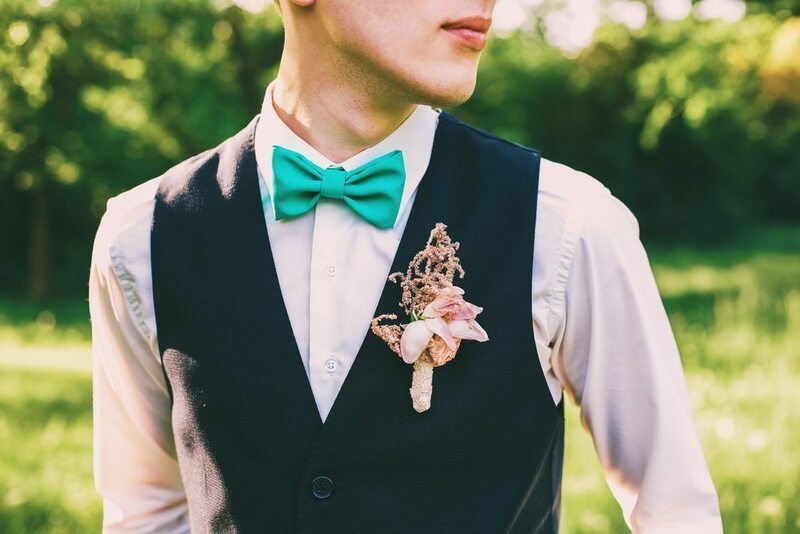 Brighter colors and bold patterns, interesting texture bow ties look great, if you want to highlight the groom’s personality, reflect the theme of the wedding or subtly complement bride’s outfit. For example, a groom who loves to sail can wear a bow tie with boats; if you are having rural-style weddings – wood, linen ties; or if the bride’s dress, for example, has a green strap, the groom’s bow tie could be green too. The unwritten rule says, people at the weddings should not wear long white dresses and surpass the bride. However, the groom should make an effort not to look bleak next to prank-loving cousin or uncle, and therefore stand out a bit too. This does not mean that you will have to spend the maximum amount of money on your tuxedo, but small accessories like bow ties can improve your look to a better side radically. Natural silk bows are definitely the ones to choose. They shine more subtle than ones made from a synthetic fabric. Exceptionally stylish and trendy are wooden bow ties, perfectly matching even to the classic suit. The ideal width of the bow is when the edges of it end in the same line as your eyes outside line. Narrower may seem childish, much wider – like a carnival or clown. Ready to wear, in a single hand gesture fastened bow tie is a safe choice. But there are a growing number of grooms, who are determined to learn how to bind this accessory by themselves. Halter bow tie seems playful, and during the party, it may be loosed, and give an additional charm. Bow ties do not mean, that a groom should not accessorize anymore. The bow tie looks great if matched with the pocket handkerchief, flowers, cufflinks and so on (even socks!). In fact, all these accents will complement each other and look great, and also create a well styled and finished look. The most appropriate time to choose a bow t is then the suit and shirt are already purchased. This way, you can see the final result in the mirror and decide which of the options are most fitting for you. You can also shop for bow ties online (since there are a lot of small business making these accessories) or embrace online couponing and promo codes to save at JCPenney, for instance, where you can also get that one dream bow tie for your big day.